Answer: The answer to your question depends on what you mean by “rocket” and “fastest,” but the graph above provides a good starting point for this discussion. Take some time to study it before proceeding. First, note that the graph has a logarithmic vertical axis. Each step up represents an increase of “times 10” instead of the usual equal intervals. Logarithmic graphs are often used when the data spans a very wide range of values, as they do here. The horizontal axis is merely a list of objects in increasing order of speed. Second, rather than answering your question literally, I’ve included some space probes that aren’t really “rockets,” but were launched using rockets. The first four terrestrial entries were included to help establish a sense of scale. So according to the chart, the record for “fastest rocket” goes to the the Helios Probes, launched in 1974 and 1976 to study the Sun in a close fly-by. It’s important to note that the speed cited for Helios is relative to the Sun. The other speeds in the chart are relative to Earth. Consider that, while Helios was still on the launch pad, it was already moving about 30 km/s relative to the Sun — that’s the speed of Earth in its orbit. The speed of Helios relative to Earth depends on which direction Helios is moving (relative to Earth) at the time the speed is measured. That speed could be anywhere from 100 km/s to 40 km/s (70 km/s ± 30 km/s) at perihelion, and about 50 km/s to 10 km/s (20 km/s ± 30 km/s) at aphelion. “Relative speed” can be confusing, unless you understand that “speed” must be measured with respect to some object or frame of reference. Relative to Earth, the record holder (at present) is NASA’s New Horizons probe, launched toward Pluto in 2006, and scheduled to arrive in 2015. 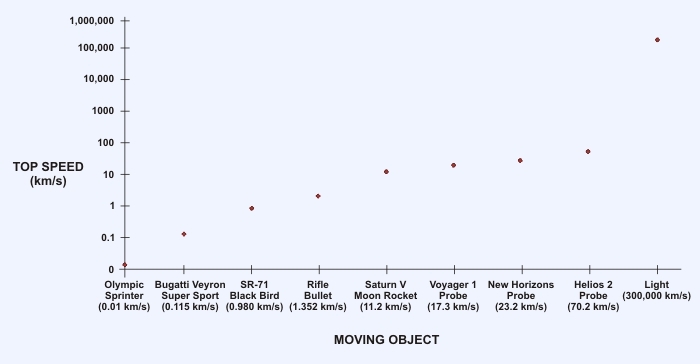 It might seem surprising that New Horizons is traveling faster than Voyager 1, which is now escaping the solar system into interstellar space. But Voyager 1 was launched 30 years earlier, using a different rocket, and was on a different mission. So direct speed comparisons can be misleading. The Olympic sprinter cited is none other than Usain (Lightning) Bolt, who ran the 100 meters in 9.58 seconds. Sports physiologists suspect this is getting very close to the maximum speed possible for the (unaided) human body, so if this record is ever broken, it won’t be by much. The Bugatti Veyron is the fastest “production” automobile to date. If you include one-off experiments like the current land speed record holder ThrustSSC, which was jet-powered, that speed jumps to 0.340 km/s (760 mph). The claim for “fastest bullet” goes to the .17 Remington using a 20 grain boat-tail form factor. Rockets destined for space must have V > 11.3 km/s (7 miles/s) to overcome the pull of Earth’s gravity. That speed is known as the escape velocity. When a spacecraft is launched from a rocket, its speed will be essentially equal to that of the rocket. But spacecraft destined for deep space (beyond the Moon) usually employ a maneuver called gravitational assist to accelerate them to speeds much faster than what any current rocket could provide. The speed of light is the final entry in my graph. It’s the cosmic speed limit. Barring the discovery of new physics, this is the top speed possible. It can never be attained by any physical craft. Only massless particles (photons, gravitons, and possibly neutrinos) can move at this speed. So yes, we’ve built some really fast machines. But the huge gap between Helios and light speed serves to remind us that we’re still a long way from traveling to the stars. Speeds approaching 30,000 km/s (0.1 light speed) would be required to reach even the nearest star in a human lifetime. And that’s 500 times faster than Helios.